What scares a king? is a chapter in History classes. And the conclusion drawn therein is that the treasure is most dear to the king. The king would thus often violate human rights in a situation where there is danger to his treasure. Of course the king would be ever prepared to face danger to his throne. In the first place we will have to understand that the Punjab can't pose any danger to the throne of Delhi ruler because there being democracy and the Sikhs are only a microscopic minority just 1.5% of India's population. Further supposing the protesters kill some pro-Govt people or employees, the ruler will be too pleased with it because he would in the first place publicise the incidence, issue public statement at which there would be public outcry and then crush the protesters with heavy hand and thus gain sympathy which will help him to get elected in next elections. Thus in the case of violent protest the ruler remains at ease because he already has an infra-structure like the police and army to deal with such situations i.e his employees are ready and rather waiting for such an eventuality. Thus in the case of violent protest the politicians are not effected at all and they rather gain sympathy of the voters. This becomes all the more relevant if a minority is protesting because in such situation the majority give overwhelming support to the ruler, as it happened in the case of Sikhs and Indira Gandhi. Indira rather herself injected and promoted violence in the Sikh movement and then got political mileage out of this. From 1981 to 1984 she would ensure high publicity to the incidence of violence by Sikhs in her national media. In the Parliament election that followed the 1984 the Congress won brute majority because of public sympathy. 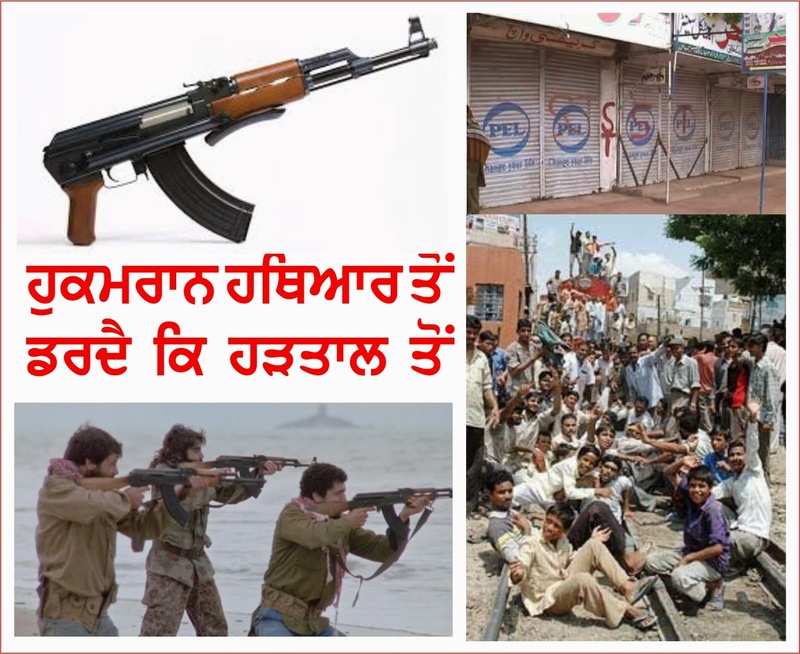 Also one will notice that the Govt touts active on social media like the Facebook would always advocate violence and provoke the Sikhs for armed struggle. Let us now come to the mode of peaceful protest like the hartal or band or strike out. This must be clearly born out in the mind that in the case of peaceful protest, it is the politician or the ruler who has to work because it is he who is issue the statement or take action. So comfort of the ruler is affected. Now in case there is a pure peaceful demonstration where there is only slogan shouting and no loss of work or production the politician in normal cases would have to work and issue statement. Of course in the case of minority or Punjab he might singly ignore the protest and even ask media not to give coverage to such a protest. However if the protest is combined with closure of vehicular traffic, shops, showrooms and establishments the ruler becomes helpless. Through a major conspiracy Punjab has been converted to a 'Consumption State' from a producing province. Thus in the case of closure protest the ruler would have to face a loss of thousands of crores of rupees in a day. 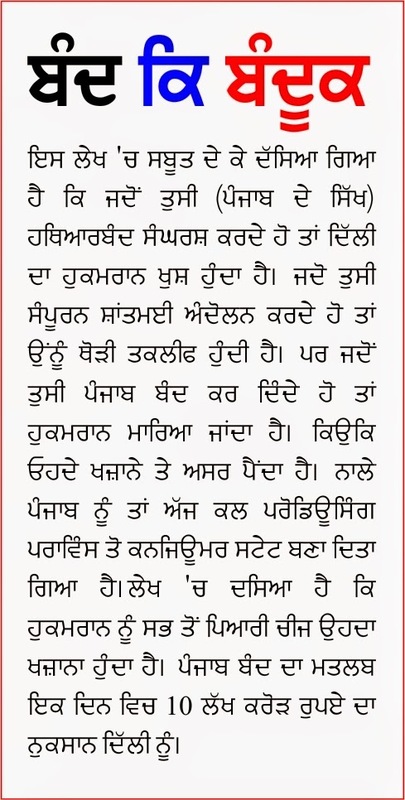 The Central Govt daily earns a huge amount from Punjab in the shape of excise duty, income tax, sales tax etc. from petrol, diesel, gas, sale of vehicles, textiles, building material, house holders goods, road taxes, railways etc. Besides the Punjab's major production i.e agriculture sector is not effected during the band. Hartal thus means a big loss to the treasure the thing most dear to the ruler. The treasure is most dear to the king is interestingly illustrated even in the case Parkash Singh Badal's ruling Punjab. He is considered to be very faithful to Delhi. He would even defend Delhi at the cost of even hundreds of lives of Sikhs but when it comes to treasure he would go to the extent to issue statement that the Centre is discriminating against Punjab. Thus in principle and especially in the case of Punjab the band or strike is the most effective tool forcing the Delhi ruler to accept the demand.